One of the reasons that Banksy become so popular is that some of his graffiti amuses people. It makes them laugh. Or, it makes a statement about what's wrong with society. It's clever. 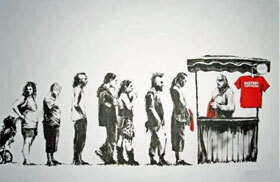 Banksy's 'Destroy capitalism and buy a shirt' picture is on the left. 'A picture is worth a thousand words' . It's human to forgive people who make us laugh. The naughty in society get away with murder because we find them entertaining. And it's the same with graffiti. 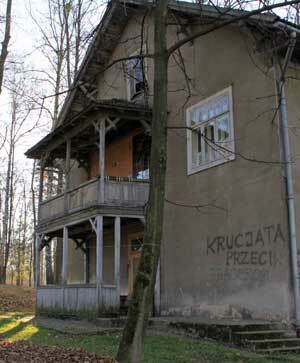 There is some graffiti on a building in Rabka, Poland, that says 'Crusade against hairdressers' and on a nearby building 'Death to hairdressers'. Someone obviously had a bad haircut. It makes most passersby smile. Send in any amusing graffiti that you see and we'll publish it (as long as it's not too rude). Do tell us its location. Toilet graffiti can also be entertaining to readers but not the property owners..
How many of us have drawn a cartoon of a teacher or friend for the amusement of other people? Our desire has been to entertain but at the expense of others. We entertain one group but offend an individual. It sometimes difficult to know where to draw the line because newspaper cartoons do just this to make a point and have no qualms about offending anyone. 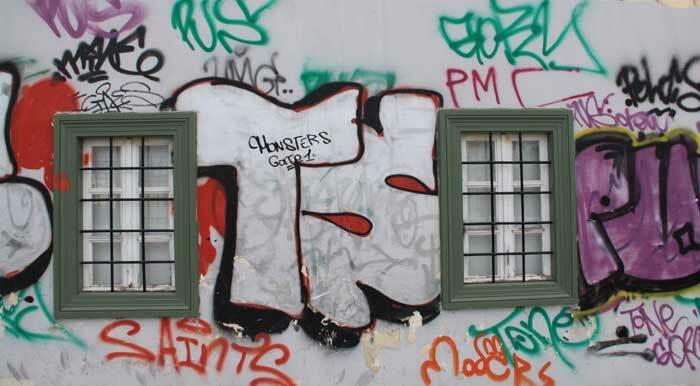 Read graffiti stories for real-life examples of the effect of graffiti on people. Have you ever been the victim of cruel written comments or images. New forms of communication such as Facebook, Twitter and mobile phones have enabled the dissemination of words and images effortless. Anyone can post comments without leaving their home, although they are not anonymous. Graffiti is anonymous unless the perpetrator is caught and tthis demonstrates another part of the problem; graffiti is more exciting because it involves risk. How amused would you and your family be to find this graffiti on your house? Perhaps it is all about 'do unto others as you would have them do unto you?